it's a weird feeling getting dressed and going out at 3am in the morning to go do something. so it is in that spirit of early morning awkwardness that i gathered up my gear and drove to laurie's apartment where she and her friend jess were waiting for me to come pick them up to see the leonid meteor shower. the air was brisk, smelled of fireplace smoke. 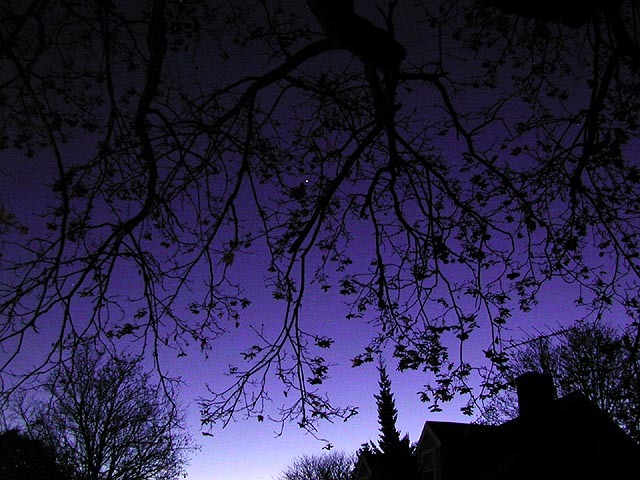 the sky was perfectly clear and bright stars glittered in the night. driving along memorial drive i was even able to see a large shooting star streaking across the sky, a good sign that there'd be a good turnout of meteors. soon after i got to laurie's place we left, with me leading the way while jess and laurie followed in another car. when we got to the brackett elementary school park (N 42°24'47.7" W 71°10'28.9") in arlington close to 4am, there was a surprising amount of people already there, silhouettes in the dark, bits and pieces of conversations overheard but not really knowing where they're coming from. 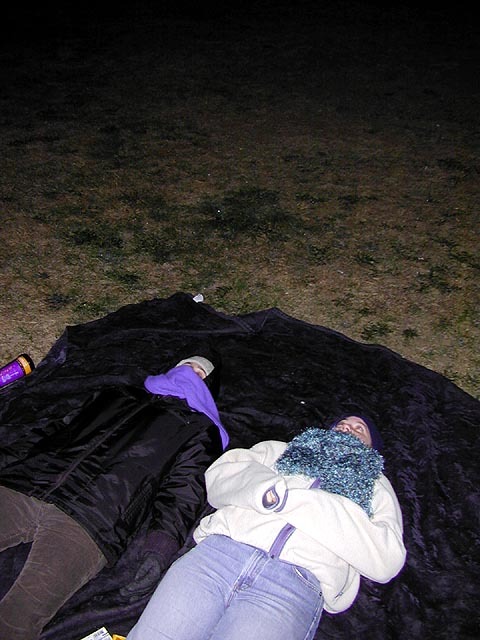 we found a place on the side of the hill, spread out a blanket, laid down, and prepared ourselves for the celestial show. watching shooting stars in the dead of an autumn night in new england is something best left for the brave or the foolish. despite the fact that i had four layers on, after about an hour on the ground (it was 33 degrees fahrenheit not factoring in the wind chill) i was cold. my face felt numb and my feet, even though i had very thick socks on, felt frozen. laurie and jess were in the same boat, and they probably had it much worse because they weren't as layered as i was. even with the assistance of chemical heat packets, our feet still felt cold. both laurie and jess had cups of hot chocolate which we all shared, but that didn't help too much, and all it did was to scald our mouth if we drank it too fast. what lessons are to be learned from tonight? 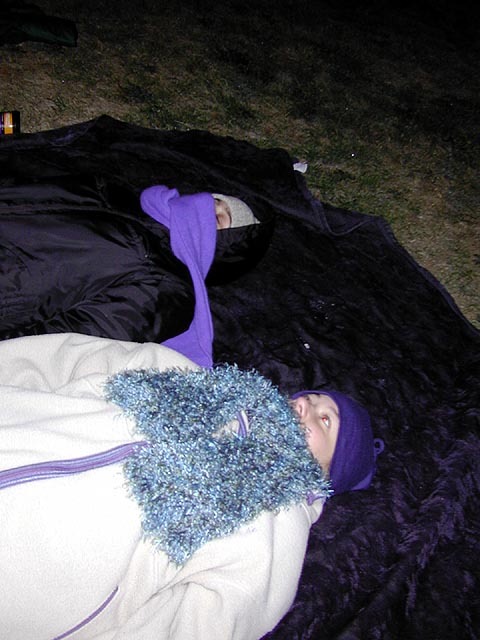 next time, wear another layer of sock, bring a warm comforter to hide underneath, and heat packets don't work so well. so, what about the shooting stars? i definitely saw the most shooting stars i've ever seen in one night. in the beginning, probably one shooting star every minute, but the closer we got to 5am, the more they came, maybe one every few second or so. they weren't small faint ones either. a lot of them were big and bright, made the whole hillside audience "ohh" and "ahh" in the dark with each streak of light in the sky. i don't believe the idealized imagery of the entire sky raining with stars to be very accurate, or maybe they're just very rare events. when they say 70 shooting stars per minute, that might be true, but they're all over the sky, and the sky is a big place. we noticed a patch of space where there were a lot of shooting star action, but the "stars" would appear and disappear, they wouldn't streak. it was later i realized what we'd been looking at was actually the leo constellation, the radiant center of the leonid meteor shower, so those were all head-on meteor collisions. we left shortly after 5am, during the peak hour. i quickly drove home and parked by the playground next to my house, where i got another 30 minutes of viewing before the sun started to rise and the sky was getting lighter. that's when i saw the most concentrated shooting star activity, one shooting star every second or less all over the sky. i laid down on a metal bleacher seat and enjoyed my second viewing. woke up at 9am in the morning (went to bed last night at about 5am) to go with my sister to a family friend of ours in needham who's a tailor (fan's tailor shop) to get some pants hemmed. it was sort of busy this morning, with people coming in and out with things they want tailored. there was some high drama when this one woman couldn't find her car key, so we looked around everywhere in the store but couldn't find it. this other woman offered her a ride home to get her spare key, but before they left, we finally found the missing item. 40 degrees this morning and i was dying for a run after not running yesterday when it was 70 degrees. life gives you lemons, you what? exactly. le-mon-ade. decked out in my winter running gear i took off with mp3 player in hand. i don't run well with musical appliances. i don't like holding things in my hand when i run, and the buds kept on getting yanked out of my ears. still, the music made the run seem to go a little bit faster. i was wearing my new pair of helly hanson running pants, which are even tighter than my other pair of nike pants. i might as well run naked since you can practically see everything. that's one incentive to run fast i guess, to escape the curious stares! it's wasn't a great run, i had to walk it a few times from being out of breath. just out of practice i guess. after the run, after a shower, i was back out again, driving around to find a suitable location for tonight's leonid meteor shower watching. i didn't go too far before deciding that the brackett elementary school park in arlington would be a good place. unfortunately, i think a lot of other people will think so as well, so i think it's going to be pretty crowded tonight up on the hill overlooking boston. funny thing is the park closes at 9pm, and i've been busted here before by the arlington cops when i was in high school. but that was because we were making a lot of noises on the jungle gym. at 5am in the morning, i doubt anyone's going to have the energy to be loud and obnoxious enough to draw the ire of the local law enforcement agency. i went to the true value hardware store in belmont to buy some yard waste bags. they have a pretty good birdfeeder selection as well, if i should ever find myself needing of more birdfeeders, i'd definitely buy from here. i got mesmerized by the various bulbs that were on sale and i ended up buy some blue anemones bulbs (blooms in june) and blue tulips bulbs (blooms in may). a quick stop at the sporting goods store to pick up a few packets of those hand and sock warmers. i've never tried them before, it'll be interesting to see how they work. i was unfortunate enough to be stuck in the slow line again. one guy was working the register while talking on the phone, with two other employees (in-training?) standing next to him and watching. i was there 15 minutes for what should've taken probably 1 minute to transact. that's 15 minutes of my life stolen from me, never to be returned. they should offer me a free complimentary stress ball to maintain good customer relationship. concord avenue is the place to be! got some money from the drive-by teller machine near the fleet bank by alewife, then a stop at burger king to buy some food. by then it was 3:30pm, my first meal of the day. a quick meal and a change into some warmer clothing, i was out the door once more helping my father rake the front lawn of all the leaves. raking's not the hard part. the hard part is actually put all the leaves into those bags (remember, the bags i got from true value?). you kind of have to get over any fears of touching gross things on the ground. something cold, something wet, something slimy, you have to go beyond that. it's actually kind of cool to be so connected with the yard, smelling the dirt, the leaves, oneness with the natural world. this is autumn! i feel sorry for city kids who've never experienced leaf raking. the best feeling is after you're all done, you look at the lawn and it's just clean, free of leaves. it's the same feeling i have after i mow the lawn (another seasonal experience that people in the city will never be able to fully appreciate).